Fall in love with this new Southern recipe from Mountain House. Layered flavors of chicken, vegetables, and fluffy dumplings in a white gravy gives this recipe that home-cooked flavor everyone's looking for. Leave your kitchen at home, pack in this Adventure Meal™, and just add water to enjoy! Mountain House Pouches - Pack light. Eat right. Fall in love with this new Southern recipe from Mountain House. Layered flavors of chicken, vegetables, and fluffy dumplings in a white gravy gives this recipe that home-cooked flavor everyone&apos;s looking for. 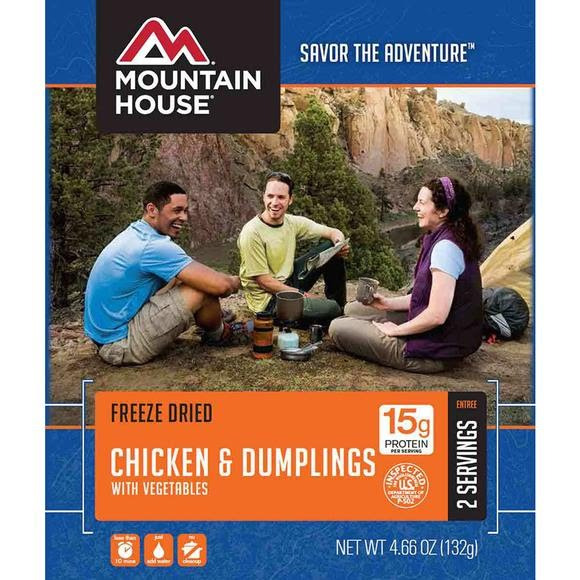 Leave your kitchen at home, pack in this Adventure Meal™, and just add water to enjoy!